Just after Thanksgiving,Dr. 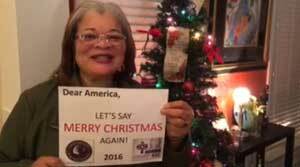 Day Gardner called Evangelist Alveda King and said: "We need to say Merry Christmas again." They quickly called their partners in Christ Rev. Dean Nelson and Rev. 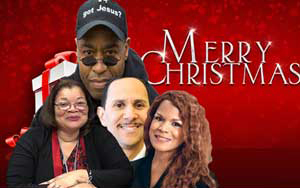 Walter Hoye to get the ball rolling and Christmas Bells ringing. The Movement has legs now. LET'S SAY MERRY CHRISTMAS AGAIN! Together they are promoting the open letter Walter has written below "to Pastors, leaders and all believers." They are inviting all to celebrate Christmas by signing on and sharing the letter far and wide. Brothers and Sisters, Merry Christmas in the mighty and matchless name of our Lord and Savior Jesus Christ, as we prepare to celebrate the birth of Christ, let us remember the reason Christ was born and the price He paid for the sins of the world as the Holy and Spotless "Lamb of God" slain before the foundation of the world. Jesus Christ, the only begotten Son of God, born of the Virgin Mary, lived and died that the world would have a second chance at eternal life in Heaven. Lifting up the name of Jesus in the public square, especially this time of year has and is the practice of billions around the world. December 25th (“Christmas Day”) has been a federal holiday in the United States of America since June 28th, 1870, when Congress created the original four holidays (“New Years Day”, “Independence Day”, “Thanksgiving Day” and “Merry Christmas." Indeed, celebrating "Christmas", the birth of Christ, is as American as it gets. As Christians let us reject the trend to substitute "Happy Holidays" for "Merry Christmas”. As Christians let us remember the admonition of Christ Himself in Luke 9:26 and boldly proclaim "Christ is the reason for season" by saying “Merry Christmas” as we consecrate His holy and miraculous birth in the language of our everyday lives. Is saying “Merry Christmas” demanding that non-Christians convert to Christianity? Just as someone in the Jewish faith who says "Happy Hanukkah" isn't demanding that Christians or non-Christians convert to Judaism, neither are Christians who say “Merry Christmas” demanding that non-Christians covert to Christianity. When we Christians greet the world with “Merry Christmas” we are openly expressing to the world that we believe in Jesus Christ as our personal Lord and Savior. Not only is the public expression of our faith in Christ encouraged in the Bible, it is one of the fundamental freedoms we have and enjoy as Americans. So let us cancel the trend to say "Happy Holidays" or any other substitution for “Merry Christmas” and both faithfully and fearlessly say "Merry Christmas”.